Slovenia (or SLOVEnia as I like to call it) may not be on your radar as a must-visit country in Europe. But it should be! Considerably cheaper and less touristy than it’s neighbors, it’s been slowly gaining popularity with tourists from around the globe. 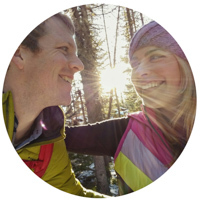 With a large national park to the north, views of the majestic Alps overhead, over 11,000 karst caves, beautiful coastline, and the friendliest people – it’s impossible not to fall in love with this spectacular country! Disclaimer: For this epic adventure around Slovenia, you’ll probably want to rent a car. You’ll be taking a tour around the country’s massive national park and it would be difficult to do via public transportation. Hitchhiking could be an option if you’re keen on catching rides with strangers! Ljubljana (pronounced “lube-li-ana”) is the largest city in Slovenia and the capital. It is a compact, clean, and pedestrian-friendly city filled with gorgeous Baroque period architecture and bizarre statues. Read our detailed post about Ljubljana here! Be sure to check out Pop’s Place for the best selection of draft and bottled craft beer in town, burgers that are melt-in-your-mouth-delicious, and giant salads. Union Pivnica is great for a lively atmosphere, homemade goulash, and a refreshing draft beer. For slightly overpriced drinks but with an amazing view of the city, head to Skyscraper. There is no shortage of desert options in Ljubljana, but for our favorite ice cream check out Vigò (and order their namesake flavor). Don’t forget to get the white chocolate topping! For delicious pub fare including giant salads try Fany & Mary on the main promenade. In the mood for a supremely crafted bespoke cocktail? Then Kolibri Cocktail Bar is a must visit! Tivoli Park – which stretches right into the center of the city and is Ljubljana’s largest and loveliest park. Tromostovje (aka “triple bridge”) – three pedestrian bridges cross the river within feet from each other in this area of the Old Town and it’s worth a stop for a photo shoot. Peruse the Central Market for locally made artisan crafts and yummy local snacks! Ljubljanski Grad (Ljubljana Castle) – a beautifully restored masterpiece that looms above the city and can be seen from the square below. It’s a short (but very steep) walk from the old city or you can opt for the funicular railway for a small fee. You can see most of the castle for free but if you want to see any of the exhibits or venture to the top of the clock tower, you’ll need to buy a ticket. Snap a selfie on the famous Dragon Bridge or add a love lock to the Butcher’s Bridge. Bled is arguably the crown jewel of Slovenia and one of the most picture-perfect little lake towns in all of Europe. Located near the eastern end of the National Park, it’s a perfect spot to spend days relaxing after all of of your adventurous hiking in the park. You absolutely cannot have a holiday in Slovenia without visiting this gem! For a yummy pizza lunch, lovely outdoor seating, and views of Lake Bled, check out Kult Klub Bled. For the best cream cake in all of Bled be sure to try the small, unassuming Slascicarna Smon! Gostilna In Pizzerija (Hostel Pr’ Pristavc) is about 25 minutes outside of Bled but is by far the best restaurant in the area. All in all we ate here 4 times (we even dined here twice in the same day!) Our favorites were the pesto pasta, the venison stew and the mulled wine! Take a boat ride out to Blejski Otok, the picturesque church on the island in the middle of the lake. Or better yet, rent a boat and row yourself! Have an afternoon stroll around the lake to view its beauty from all angles. It’s 5 kilometers to complete the loop and there are several spots to stop for a glass of wine or a snack along the way. 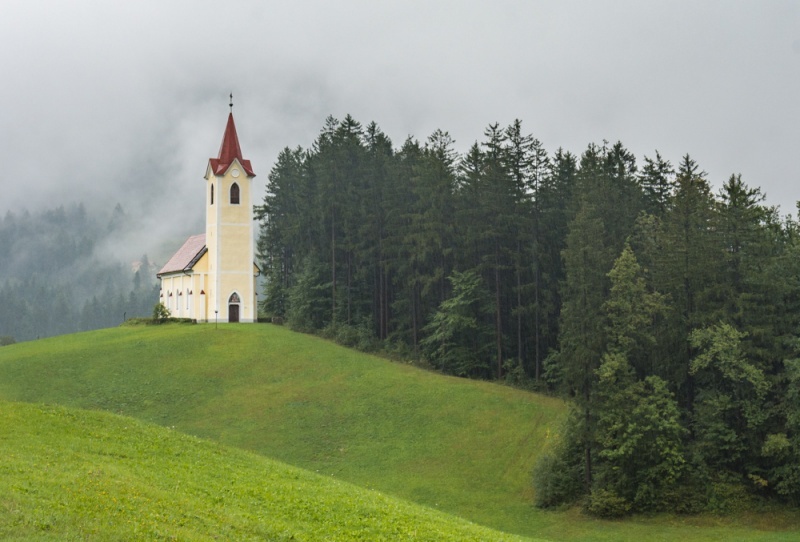 Lake Bohinj – is the quainter, quieter neighbor to Bled. 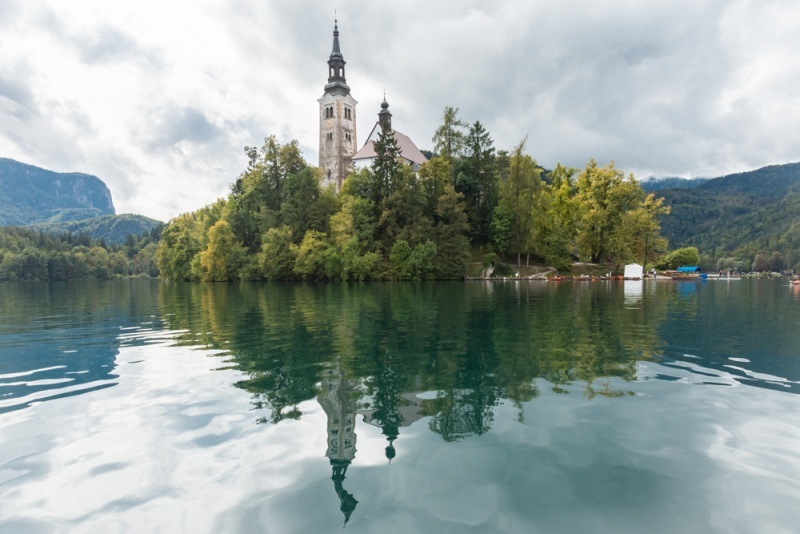 It’s just a 30-minute drive from Bled and boasts a beautiful lake and plenty of restaurants and accommodations if you want to escape the Bled crowds. Stop at Strandcafe Kramar for a glass of wine and epic views of the lake! 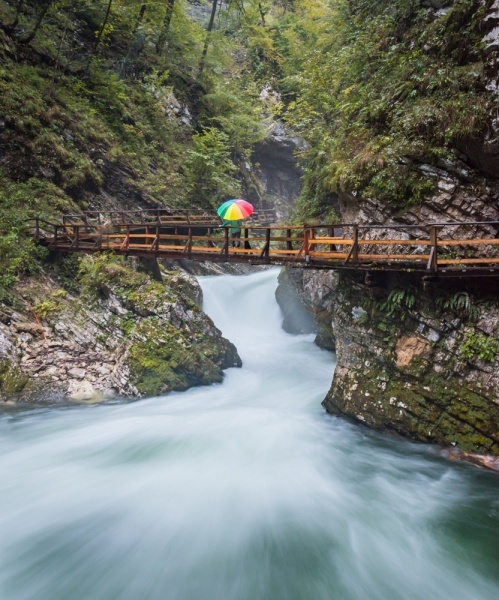 Vintgar Gorge – just a 15-minute drive from Bled is a stunning gorge with a short and easily accessible hike right on the river. It gets busy in the middle of the day so make the trip early in the day or around 5pm to avoid the tour buses. Slovenia has a small bit of coastline with views of Italy from across the Adriatic. What really makes the coast of Slovenia special are the charming port towns and lovely locals. 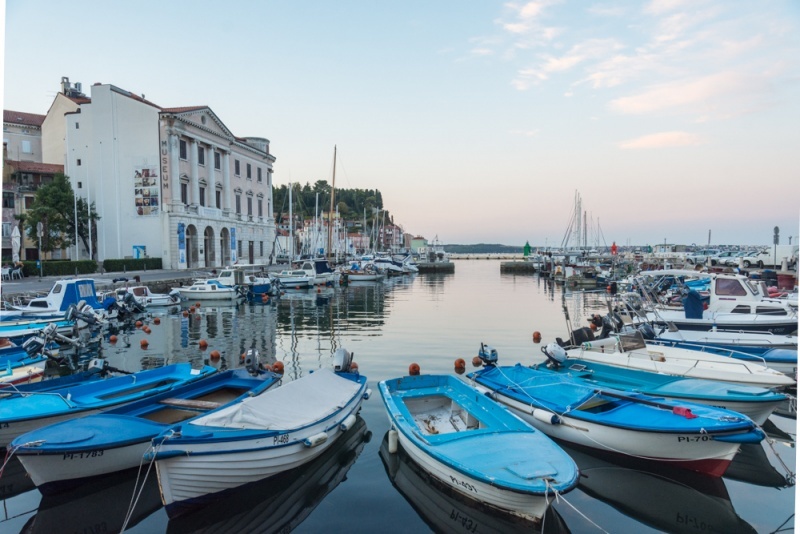 There are several coastal towns to choose from or you can devote your time to our favorite… Piran. While it lacks sandy beaches, it makes up for it in Venetian-style alleyways, gorgeous views of the sea, castle walls, and a pristine central square. You’ll love getting lost in the maze of alleyways of this darling, quaint town. For a fun setting for a morning coffee or afternoon beer, check out 80s Caffe Bar. They rock out to popular American 80’s jams all day! With comfortable seats, reasonable prices, and delightful muesli with fresh yogurt, you can’t beat Mestna Kavarna for an early morning snack. A reservation for all restaurants in Piran is recommended during busy season as they are all relatively small and get packed. Gostilna Park is no exception because the food and the setting are absolutely divine! Try the Morski Poker for a delicious and huge selection of seafood (the stuffed calamari is unreal) and the freshly baked garlic bread. Their house white wine is the most delicious in town! Again, a reservation is recommended for Pri Mari – a quaint little restaurant with excellent cuisine. Try the mussels in white wine sauce and their unique homemade gnocchi. Stroll around the waterfront at sunrise or sunset. Climb the city walls and soak in gorgeous views of the sea from the clock tower. Go for a dip in the clear water and then lounge on the rocks lining the boardwalk. Triglav National Park sits in the Northwest corner of the country encompassing Slovenia’s portion of the Julian Alps. It is Slovenia’s only national park, but with a park as massive and stunning as this, you really only need one! 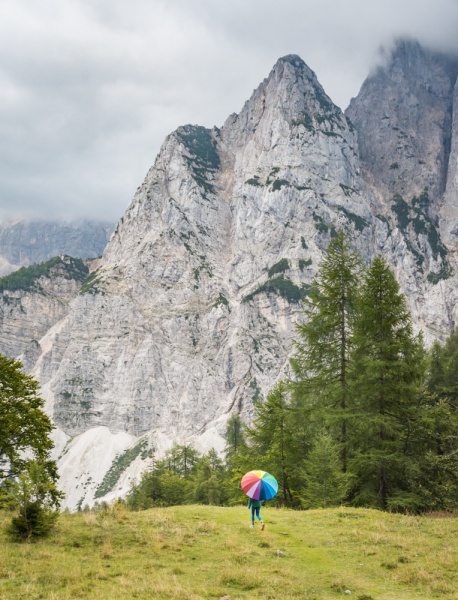 Start with Tolmin Gorge (see our list of hikes below) and drive the complete perimeter of the park clockwise, stopping in the charming towns along the way. 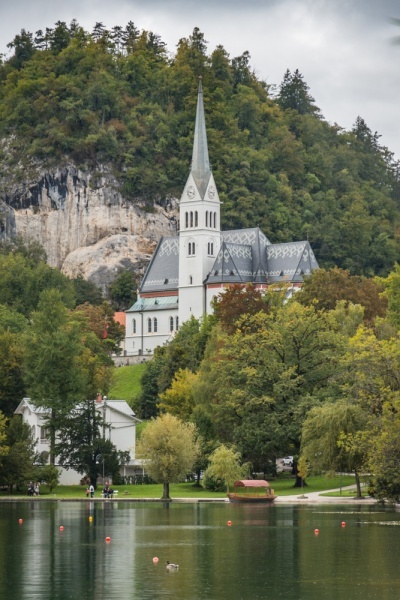 Bovec is a little town along your route that is a hub for a variety of outdoor adventures in the park. 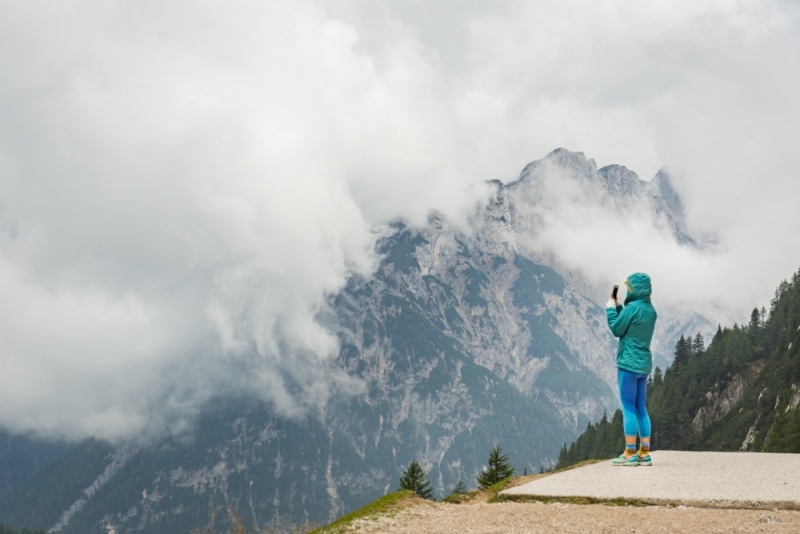 It offers helpful tourist information, outdoor apparel shops, delicious restaurants, and local craft beer all with a gorgeous mountainous backdrop! Check out Thirsty River Brewing which has a fantastic selection of local draft beers with a fun outdoor atmosphere that’s perfect for people watching! Letni Vrt is serving up a wide selection of delicious pizzas and a few dishes that are unique to the region. There are countless epic hikes in the park but these 4 are not-to-be-missed! 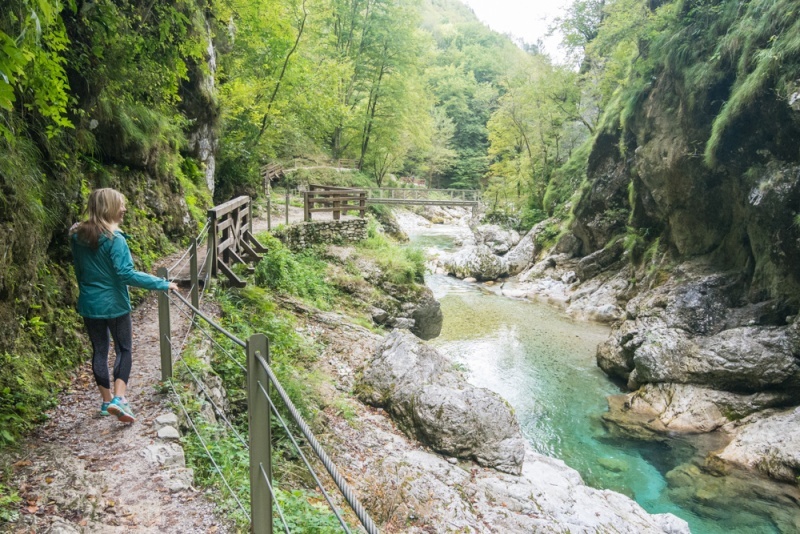 Tolmin Gorge – the views of the river all along the Tomin Gorge hike are amazing; the clear blue water will have you dying to take a dip (but beware, it’s freezing!). There are a variety of bridges to cross and caves to explore as well as 500 stairs to ascend (or descend depending on the direction you head) which keeps this hike interesting for the entire 3 kilometers! 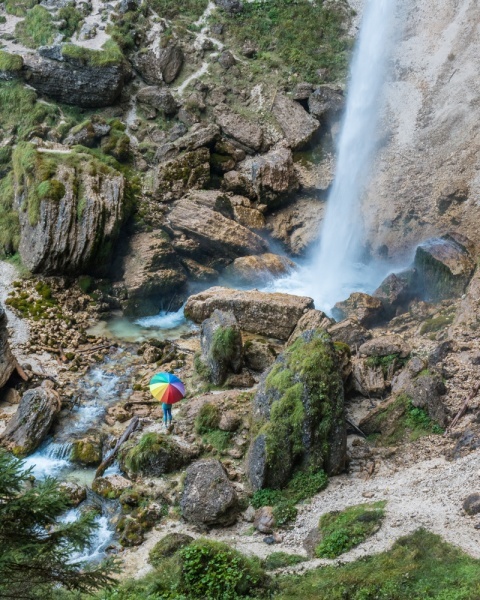 Slap Boka (Boka Waterfall) – this fairly short and easy hike meanders through a lush forest to a lookout where you can see one of the tallest waterfalls in Slovenia from afar. Be sure to read the placard, this waterfall has an interesting story! Kozjak Waterfall (Slap Kozjak) – this 2.5 mile, fairly flat hike follows the Soča River to the 50′ Kozjak Waterfall inside of an amazing natural limestone amphitheater. The entire hike is gorgeous but the waterfall at the end is certainly the highlight! Peričnik Waterfall (Slap Peričnik) – a short but steep hike will lead you to this beautiful waterfall but the real attraction is the pathway that leads behind the falls. The view of the surrounding mountains from behind the waterfall is truly breathtaking! Don’t forget a jacket or an umbrella – it’s wet back there! Logarska Dolina is a stunning valley located in Northern Slovenia where you’ll find lovely hikes and secluded mountain cabins. And you won’t find a lot of other tourists. You can choose to pamper yourself at the Hotel Plesnik Logarska Dolina which offers a variety of spa packages with a gorgeous waterfall backdrop. Or sleep in a quaint rustic cabin high in the mountains overlooking the valley at Guesthouse Planinski Dom Majerhold which is run by the sweetest family (they also offer delicious home cooked meals!). If you visit in the summertime they have a barrel tub for a soak with epic mountain views! Postojna Cave – nicknamed “the Queen of Caves”, this is the most popular cave in all of Slovenia. You’ll venture deep underground via train ride. From there you’ll have the opportunity to marvel at the unusual formations, stalactites, and stalagmites. This cave is also home to the “human fish”. Predjama Castle – just 9 kilometers from Postojna Cave, this is the largest cave castle in the world! Škocjan Caves – the deepest and largest underground canyon in the world! Get lost in the maze of underground galleries in this unique and special place! We hope you’ll love SLOVEnia as much as we did! Planning a trip to Slovenia? Check out our favorite books and resources! Previous Post Ljubljana, Slovenia – The Little City That Packs a Big Punch!